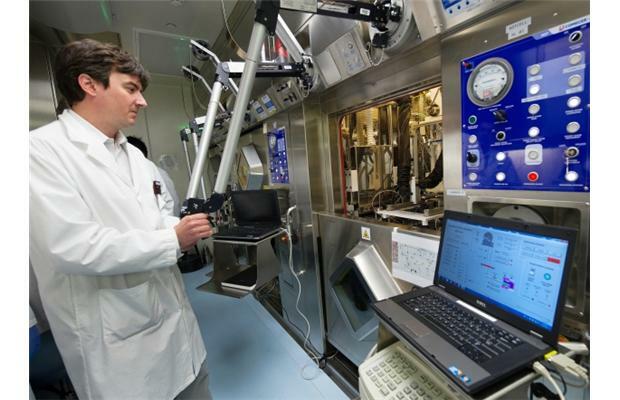 BC breakthrough in isotope production for medical imaging. Dr Francois Benard and TRIUMF featured: CBC.ca, The Vancouver Sun, The Vancouver Province, The National Post, and on The CBC National (video). Scientists in Vancouver have found a way to create a medical isotope in significant quantities without using a nuclear reactor, a feat they call a world first. A specially adapted cyclotron at the BC Cancer Agency can now make enough technetium-99, called the workhorse of nuclear medicine, to serve the needs of all the hospitals in a metropolitan area the size of Vancouver. Dr. Francois Benard, scientific director of functional imaging at the BC Cancer Agency, said researchers from various fields including physics, chemistry and medicine have adapted existing technology to allow cyclotrons already in use across Canada to increase production. The work involved a host of technical improvements to improve control of the process and the quantity and purity of the product. A cyclotron accelerates atomic particles to collide with target atoms, a process that generates short-lived radioactive isotopes such as technetium-99. Technetium-99 used in about 90 per cent of all nuclear medicine imaging, typically aimed at tracking blood flow in cardiac patients and also identifying tumours in cancer patients. The federal government has poured about $15 million since 2009 into research in this area by the BC Cancer Agency and TRIUMF, the particle physics laboratory at the University of British Columbia. There was a worldwide shortage of medical isotopes – and much finger-pointing in Ottawa – after a nuclear reactor run by Atomic Energy of Canada Ltd. at Chalk River, Ont., was shut down for safety reasons in 2007 and again in 2009. Formerly the supplier of 40 per cent of the world’s technetium-99, the government has decided to get out of the business entirely and Chalk River will no longer produce it in about two years. International observers have taken a wait-and-see attitude to the Canadian process, looking for evidence that it could make medical isotopes in “clinically significant volumes,” he said. “Now we’ve proven that.” But whether regional cyclotrons across Canada will be put to work to make medical isotopes is not known. Dr. Daniel Worsley, head of nuclear medicine at Vancouver General Hospital, says the landscape has changed dramatically since the Chalk River fiasco and most hospitals now have secure supplies of technetium, with no incentive to change unless that is threatened. Price could also play into the equation if the locally produced isotopes can be made more affordable than the alternatives, said Worsley. So far, the cost of using the process on a commercial scale is not known, though Benard expects it would be cheaper than using a reactor. Benard says another benefit of using medical cyclotrons instead nuclear reactors is that a cyclotron produces no radioactive waste. That’s because technetium rapidly degrades. Technetium has a half-life of six hours, meaning half of its radioactivity disappears in six hours. It must be produced on a daily basis, then distributed to nearby hospitals for immediate use. While the short half-life makes technetium less useful for hospitals a distance from a cyclotron, the breakthrough could have practical application in a large city, said Dr. John Powe, a nuclear medicine specialist at VGH. Hospitals now typically rely on a supply of molybdenum produced by nuclear reactors, which breaks down to create technetium, but does so over the period of a week.